Back To Africa with Brother Ahmose | New Growth Hair Magazine | We capture the culture of urban barbershops and beauty salons. Ahmose Kheperkara was an inquisitive child born in Columbia, SC, he was raised in a family with deep cultural roots; his family was actively engaged in the civil rights movement. After graduating high school, Kheperkara traveled North to attend North Carolina Central University to pursue a dual degree in Computer Information Systems and Business Administration. In 2004, Ahmose Kheperkara decided to pledge Kappa Alpha Psi and because of his appetite for seeking knowledge, his fraternity brothers named him Reconnaissance. Kheperkara searched for the deeper meaning of his fraternity, its rituals, and its purpose. During his senior year at NCCU, he received a copy of George GM James’s Stolen Legacy: The Egyptian Origins of Western Philosophy but didn’t read the entire book until after graduation. 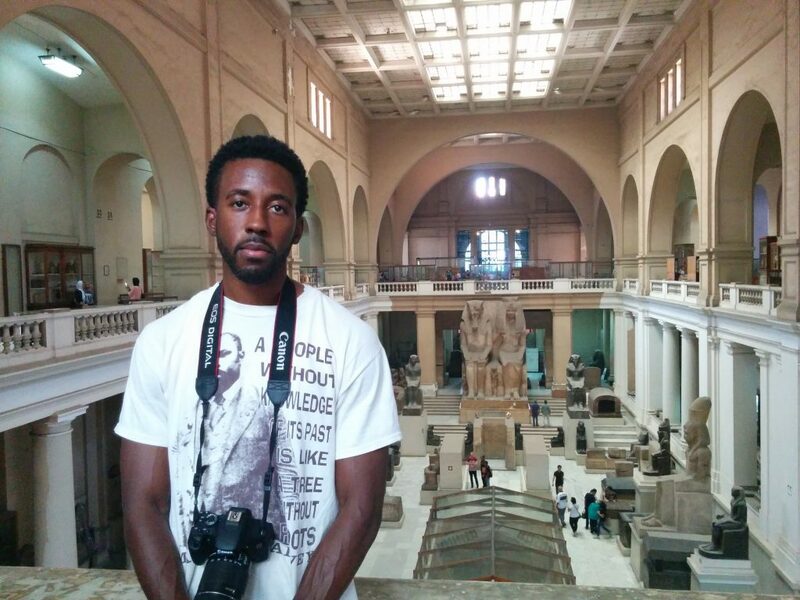 While many of his classmates were celebrating graduation, Kheperkara put his reconnaissance skills to work; he connected the dots between Greek letter organizations and African history. Kheperkara’s research led him to travel to Greece, Egypt, Ghana, Sudan, Ethiopia, and several other countries. 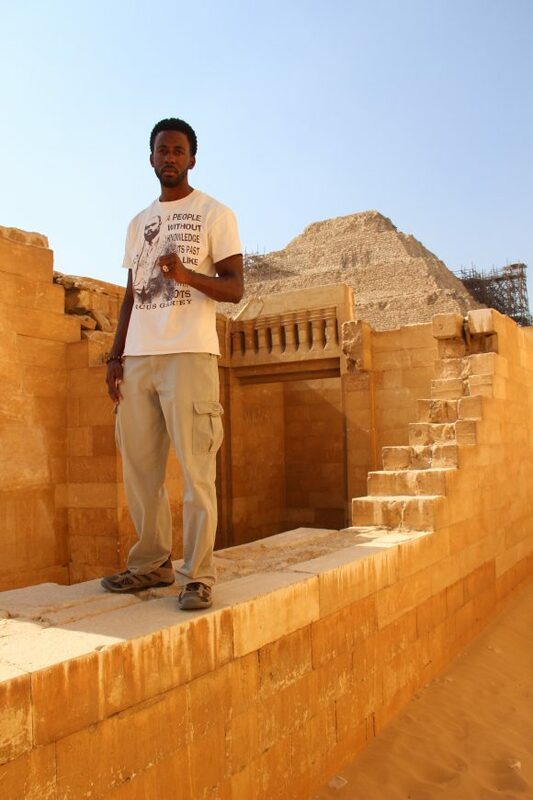 Below is my interview with Ahmose Kheperkara about his discoveries during his world travels. Phillips: When were you exposed to the significance of African history and Africa culture? Kheperkara: Growing up, I was exposed to African and African American history through the lenses of the Civil Rights Movement and my family’s history in South Carolina. I didn’t have a bird’s eye view of African history but I saw more than most of my peers. During my time at North Carolina Central University, I was introduced to George G.M. James’ Stolen Legacy. When I was a student, I skimmed through the book but I didn’t read it in its entirety until after I graduated. Later I read Chancellor Williams, Destruction of Black Civilizations which sparked my interest in going much more in-depth into African history prior to The Maafa (The Transatlantic Slave Trade). Phillips: When was your first trip to Africa? What did you learn? 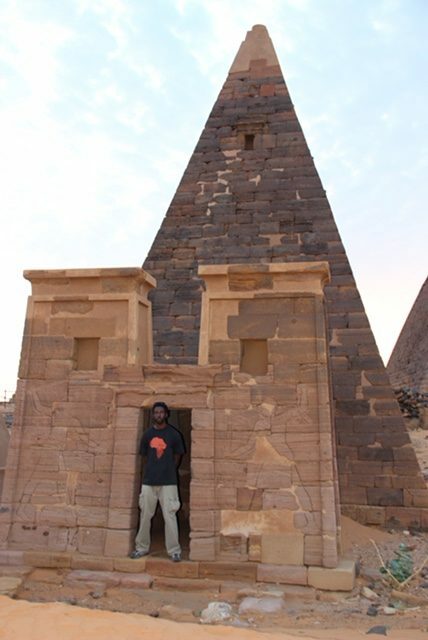 Kheperkara: In 2012, I travelled to Kemet (Egypt) with Ashra Kwesi on his Kemetnu Know Thy Self Tour. This experience was an eye-opener because I was able to witness the greatness of what our ancestors did in Africa. Reading a book opens your mind but traveling to The Nile Valley allows you to experience what words can’t describe. My first trip to Kemet lit the fire under my feet to learn our history so that I can share our historical greatness with others. 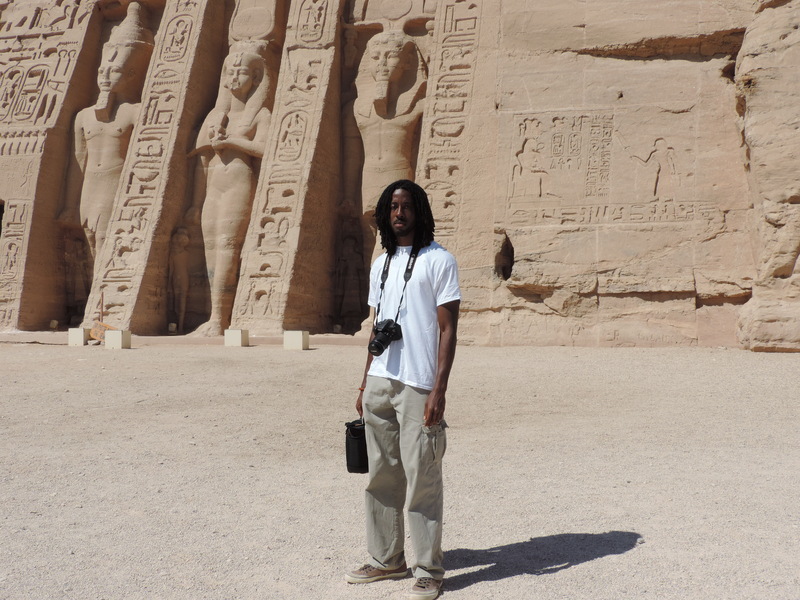 Since my 2012 trip to Kemet, I’ve travelled back to the African Continent every year. I’ve been to Kenya, Ethiopia, Sudan, Uganda, Ghana, and Rwanda. Phillips: What is the common theme or the common thread that you picked up from your travels? Kheperkara: From a historical stand point, there is a lot of evidence of our greatness in Ethiopia, Sudan, Egypt, and Uganda. There are plenty of physical structures and museums that you can visit that allow you to travel back at least 200,000 years in time. In Ethiopia, they have a museum that allows you to go back over 3 million years. I don’t want your readers to think of Africa as Zamunda (a mythical African country in Eddie Murphy’s Coming To America), there are a lot of things that need to be improved such as concentrated poverty in certain areas. These conditions aren’t due to African countries being poor. The primary reason is that African countries are exploited by outside forces, primarily business interest in the Western world. Many of the African leaders are puppets of Western business interest so they allow the exploitation to continue in exchange for political power. The only African country that I am aware of that hasn’t been colonized is Ethiopia. I’ve travelled to Ethiopia and I can tell that their culture hasn’t been broken by outsiders. Because their culture has been intact for at least 200, 000 years, it’s noticeably different from other African countries that I’ve visited. The common thing that I see around the African continent is; I see great historical evidence of what we did in the past, I see some poverty through exploitation and I also see the remnants and the effects of colonialism today. 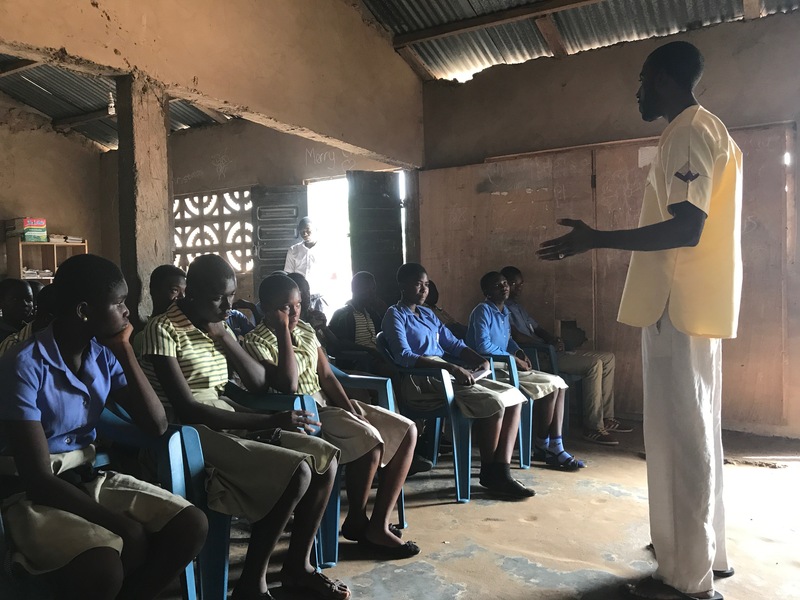 Phillips: Please share with our readers the experience of your recent trip to Ghana. Kheperkara: Four months ago, I travelled to Ghana. I visited Accra, Cape Coast, and Kumasi. During my time in Cape Coast, I visited the Slave Dungeon which was an experience that I will never forget. African Americans and people of the diaspora will probably go through a range of emotions when they experience what our ancestors went through to before their voyage to the Americas. Some of the tour guides are very good and provide accurate information about the entire experience while others give a watered-down version to make European tourists feel comfortable. After visiting the Slave Dungeon, I visited a school in Oyarifa, a village in Ghana and I was their guest speaker. My first question to their class was ‘what’s the most important journey that you ever take in your life?’ One young sister answered; ‘the most important journey is the journey to Christ’. Another young brother said, ’the journey to success’. I asked him ‘what does success look like?’ and he replied, ‘getting money.’ The majority of the students’ responses were either from a religious or capitalistic stand point. After they finished their attempts to answer my question, I provided my answer: ‘the most important journey that you will take in life is the journey into yourself because once you know who you are and the legacy of your ancestors; it’s going to strengthen and empower you to move forward and to achieve greatness like your ancestors’. Then I asked ‘what can you tell me about yourself and your history?’ A young brother stood up and said ‘our history started when Henry the Navigator came down from Portugal’. I was shocked that this young brother thought his history started when a Portuguese explorer and slave trader came to his country to find gold and enslave his ancestors. I asked the class if they could tell me anything about The Nile River. I didn’t get a response from any of the students so I quickly proceeded to teach them about how Africans gave civilization to the world, how life started in Central and East Africa and then migrated up the Nile River. I shared information with them about the great civilization that came into Sudan and Ethiopia. The students were blown away and the conversation shifted to how we got into the current conditions in Africa. I could see the light bulb in these young children start to go off and they quickly started to use their critical thinking skills. Phillips: What suggestions do you have for parents who want to enlighten their children about Africa and African culture? Kheperkara: I suggest that parents purchase The Falsification of African Consciousness by Dr Amos N Wilson because in this particular book he breaks down, from a psychiatric stand point, why it’s important for your children to know themselves. In Dr. Wilson’s book, he asserts that children must know who they are to value themselves. Dr Wilson’s definition of falsification of African Consciousness, says that, the false thoughts and ideas that have been placed inside your head and your children’s head don’t represent who you truly are. It’s important for parents to invest in an African centered education because it will give their children a sense of pride, self-respect, and dignity that will allow them to successfully move forward in this country. Thank you for sharing this information. I also learned a lot. I think it is very important that we not only teach Black children about their heritage but invest in the opportunity for them to receive first-hand knowledge of their culture by traveling to Africa. Instead of buying the latest fashions, perhaps some of those funds can be saved and used to allow Black children to explore Africa. It is a humbling and breathtaking experience.